by Elaine Scarry. New York: W.W. Norton and Company, Inc, 2014. 592pppp. Cloth $35.00. ISBN: 978-0-393-08008-7. Books on US presidential war power are always topical, reflecting the modern constitutional order. Although the War Powers Resolution was passed in 1973 to increase congressional control over foreign policy, Presidents have since initiated over 135 US military engagements abroad (Grimmett 2012). This number does not include hundreds of drone strikes in Yemen and Pakistan over the past decade, nor the armed advisors President Barack Obama sent to Iraq this past June. The cold war-era unilateral “Commander-in-Chief” narrative persisted after the collapse of the Soviet Union and was reinvigorated after 9/11. Over the past dozen years, a combination of new and old legal rationales for executive power transcended partisan change in the White House and continue today, despite signals of presidential war fatigue in public opinion and Congress. As he pivoted from the threat of air strikes in Syria in 2013, President Obama still insisted that he possessed a singular capacity to judge the national interest abroad, and the constitutional power to act. But, he said, “I believe our democracy is stronger when the President acts with the support of Congress” (White House 2013). For much of the past century, presidents have treated congressional war powers as an institutional courtesy at best (irrelevant annoyance at worst) rather than a constitutional requirement. No party in Congress or ideological bent in the federal court has made a serious attempt to correct this view. The default assumption of US foreign policy is the nuclear war model: the fate of the world rests on a single person. Professor Scarry presents these arguments in a social theory framework (she is the Cabot Professor of Aesthetics and General Theory of Value in the Department of English at Harvard College). She weaves together a variety of scholarly approaches in THERMONUCLEAR MONARCHY, including ethics, history, law, linguistics, philosophy, and classics. Scarry does not engage much contemporary political science literature on any of the three branches, choosing instead to emphasize primary sources in the institutional parts of the book, such as presidential and congressional speech, legislative processes, and documents related to the US Constitution’s creation and ratification. Throughout, Scarry’s writing and argument style will be more familiar to readers with a background in contemporary literary theory and other fields in the humanities. The book was not written to explain the technical side of nuclear weapons development, nor the international treaties and protocols that govern their existence today. Readers of this particular review should also know that there is little discussion of case law surrounding foreign policy and executive branch action (although she cites Joseph Story’s Commentaries on the Constitution several times). But putting aside Professor Scarry’s choices of emphasis and presentation, her provocations are bracing and deserve attention from scholars of political science and law, who rarely see normative constitutional treatises of this book’s ambition and scope (outside the oeuvres of Bruce Ackerman, Louis Fisher, and Sanford Levinson, among a few others). Scarry presents her argument in three parts. The first will probably be of greatest interest to those who study US constitutional and military development. She says unequivocally that nuclear weapons are “outlawed” by the Constitution in two ways: the declaration of war clause in Article I, Section 8 and, more surprisingly, the 2nd Amendment. Scarry describes these provisions as double-layered “distributional requirements” (p.31), meaning the formal declaration of the House and Senate needs more than a president’s signature; legitimate war also requires ratification by the people carrying arms into the field. In Chapter 1, Scarry argues that nuclear weapons make legislative deliberation “ludicrous” and thus “infantilized” Congress over the past six decades, which she ties to current lamentations of congressional dysfunction (pp.32-33). In addition to the clear enumeration of Congress’s power to declare war, which should be neither appropriated nor delegated, Scarry explains why the public deliberation that precedes a proper war declaration is edifying, puts the members on the record, and broadens responsibility for the act. In Chapter 2, she says the 2nd Amendment was designed to give citizen-soldiers agency in battle. They can affirm, resist, or even rebel against military and civilian leadership. She offers many examples to show how desertion, mutiny, poor morale, and the abandonment of conscription have influenced war outcomes in the US and around the world. (These insights are certainly relevant to the lackluster performance of the Iraqi army against Sunni militias in 2014, which has led to calls for new US military support). While specialists may disagree with her historical and legal analysis, Scarry’s discussion of the 2nd [*344] Amendment as a “distribution of authorization over our nation’s arms” (p.98) is at least a refreshing diversion from conventional gun rights debates. To her, the purpose of Article I, Section 8 is the same as the 2nd Amendment: “consent processes will be more rigorous, not less rigorous, in wartime” (p.136). Part II focuses on the effects of nuclear weapons on the social contract. Emphasizing classical and enlightenment philosophy, with a special emphasis on the published work and correspondence of Thomas Hobbes, she argues that above all else “the social contract is a contract for peace” (p.155). In Chapter 3, Scarry argues that Hobbes stressed a specific type of equality in the social contract: “equal power to injure and be injured, regardless of apparent strength,” (163) which makes the concentration of nuclear weapons in just a handful of countries especially dangerous, not to mention the constant dread of non-state actors’ obtaining the materials or hacking into weapons systems. A general “aversion to war” and avoidance of bodily injury is also central to the social contract theories of John Locke, Jean-Jacques Rousseau, and Immanuel Kant (p.181). In Chapter 4, Scarry explains further the “two-story” architecture of the social contract. Level one is the “never-injure rule,” except for self-defense. Level two is the “release” from the first rule when the government is granted the power to punish and make war because someone or a group has broken the “never-injure rule” (p.189). The first level allows the government to check the people, with the reverse true in level two. Then, in an extended discussion on the development of judicial and parliamentary processes (mostly in England), Scarry connects Parts I and II. She argues that legislative assemblies were invented a thousand years ago primarily to prevent or endorse executive war (p.203). In addition, military observers from Homer to Abu Ghraib whistleblowers show how and why it is also incumbent upon individual soldiers to assess the legitimacy of war acts (pp.246-247). In Part III, Scarry picks up a key theme from her own earlier work on language, medicine, and the law to explain how nuclear weapons upset the recognition of “the body as the ground of consent” (p.269). Continuing an emphasis on Hobbes and Locke (the latter was also a physician), and roaming through Benjamin Cardozo, John Rawls, and Michael Ignatieff, among others, Scarry re-explores in Chapter 5 how the medical concept of injury, and aversion to it, is at the heart of the governmental social contract as well as consensual relations between individuals and groups. Chapter 6 is titled “Thinking in an Emergency” and ties bodily consent back to public deliberation. This chapter may hold special interest for those who study the legal parameters of executive power in the US and abroad. The 20th Century invention of “chronic emergency” has bled into the 21st, even as presidential candidates of both parties rebuke executive overreach (until they win the office). Torture, extrajudicial executions, and other secretive facets of the “War on Terror” undermine public deliberation when acting becomes more important than thinking. Scarry explains that the question of whether we can remain coherent in an emergency is as old as Aesop and Thucydides (pp.319-321). She then turns to worldwide “habits in an emergency,” ranging from the development and re-assessment of [*345] cardiopulmonary resuscitation to medical mutual aid contracts and voluntary associations in Africa, Canada, and Europe. The point of this section is to contrast these other practiced communal arrangements for emergencies with the concentrated processes of nuclear war, such as the well-known fact that the “briefcase” (or “football”) of nuclear launch codes must be near the president at all times. She also lambasts Congress for helping to reverse the “two part rule of an emergency – act quickly if the goal is to prevent injury; act slowly if the goal is to inflict injury” (p.374). Scarry is openly frustrated that today’s Congress obstructs all manner of domestic needs, but clears legislative barriers for war. 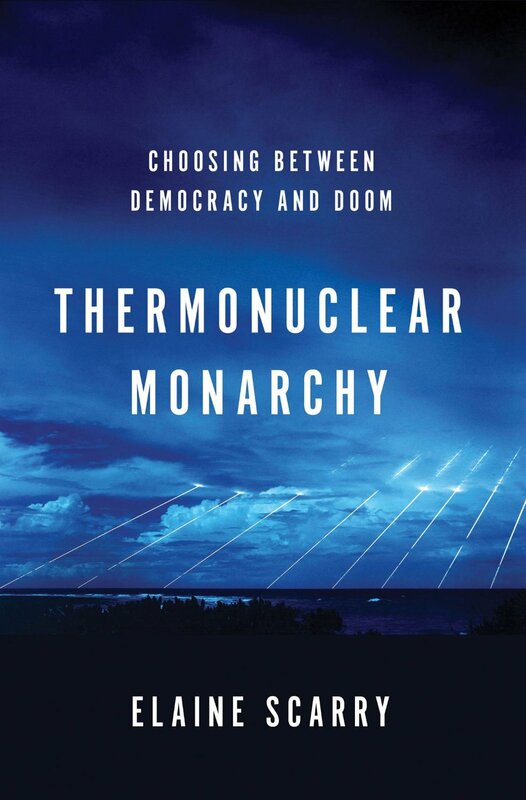 Though her jumping off points are different from contemporary political science and legal scholarship, THERMONUCLEAR MONARCHY rings some familiar alarm bells on presidential war. Criticism of executive overreach on “emergency” and war powers target both the executive and legislative branches (Adler and George 1996; Pfiffner 2008; Edelson 2013; Fisher 2013a, Zeisberg 2013, among many others). On the other side are a variety of arguments that say, in effect, that presidents have a legitimate obligation to punch out the walls of their authority when they deem it necessary (Yoo 2010; Posner and Vermuele 2011; Howell et al. 2013). Scarry’s book is not organized to confront the legalese that supports an “inherent/unified” theory of the presidency, but her arguments still cut directly at its roots. The Congress angle of Scarry’s book will, unfortunately, get less attention from scholars and practitioners. Conventional wisdom says Washington is paralyzed from toxic partisan differences (Mann and Ornstein 2013). There is less attention paid to the extraordinary consensus behind Congress’s support of presidential war under a variety of partisan landscapes and policy environments. It is true that Democrats and Republicans subject opposition presidents to tongue lashings on foreign policy, but legislation to direct US foreign policy does not always follow the rhetoric. But Congress’s capacity to judge the national interest is a complex and open question. Looking back at the 2002 floor debates on the Authorization for the Use of Military Force against Iraq (Public Law 107-243), Representatives and Senators who voted against the bill (or advocated a more diplomacy-centered alternative) were savaged, but many of them made more accurate predictions of the war’s trajectory than its proponents. Without citing this point directly, THERMONUCLEAR MONARCHY supplements a scholarly debate among those who see Congress flexing its muscles before war (Howell and Pevehouse 2009), afterward in oversight (Kriner 2013), or ambivalently, with cycles of delegation and regret (Farrier 2010). The judicial aspects of this book are likely to be the most intriguing, but also frustrating, to law and courts scholars. Scarry says vaguely that a legal case should be formulated “that shows how nuclear weapons disenfranchise the entire population and thereby violate the Second Amendment … If the United States population comes to hold a strong view on this matter, the court will eventually act” (p.87). If Congress and the public are not willing to pick up their constitutional tools “lying unused on the ground” (p.404) to abolish nuclear weapons, and it is unlikely that any [*346] future president will pare back the executive branch’s national security infrastructure, can and should courts fix these constitutional wrongs? Scarry hits a nerve here. It is an underappreciated fact that federal court precedents on war predate MARBURY V. MADISON and are usually more Congress-centered than suggested by the oft-quoted dicta from US V. CURTISS-WRIGHT (1936) (Glennon 1990; Silverstein 1997; Fisher 2005, 2013b). In the wake of the bodily and institutional devastation wrought by the Vietnam War, some were skeptical about whether the War Powers Resolution would be sufficient to re-balance power without federal court support (Keynes 1982; Koh 1990; Ely 1993). Instead, federal courts built a wall of justiciability barriers to punt foreign policy cases (such as Congress members’ lawsuits) back to the political process. Scarry does not explain why courts would choose to take up cases on nuclear weapons when they have spent decades developing strategies to avoid direct war powers questions (as advocated by Bickel 1962 and Choper 1980). As recently as 2002, a federal district court dismissed a lawsuit against President G.W. Bush for withdrawing unilaterally in December, 2001 from the thirty year-old Anti-Ballistic Missile Treaty with Russia (Adler 2004). Here lies the central tension of THERMONUCLEAR MONARCHY. After a scathing examination of inter-branch power imbalance, Elaine Scarry still places a lot of faith in constitutions generally, and the US Constitution specifically, to seek peace over war. But if her main criticism of institutional developments on nuclear weapons is convincing, it seems a remote hope that popular apathy, congressional abdication, and court disinterest will all reverse to force the executive branch into a more modest institutional posture. Ironically, the current poisonous political environment has given the president even more cover to push unilateral executive action on domestic and foreign policy, including nuclear weapons reductions. In a speech in Prague early in his presidency, and more recently in a State of the Union Address (White House 2009 and 2013), Obama did not say that his hands were tied by Congress on this issue. Nor have executive branch officials pledged to the Senate that they will go through formal treaty processes when negotiating with Russia on nuclear reductions (Woolf 2014). A quick search on https://beta.congress.gov/ for “nuclear weapons reduction” or “abolition” shows only one bill that targets the US nuclear weapons arsenal in the 113th Congress. H.R. 1650 was proposed by the at-large Representative of Washington DC, Eleanor Holmes Norton, and died in committee. The separation of powers system was designed to inspire and sustain the branches’ different perspectives on the national interest through (relative) electoral diversity and competition for power. Excessive aggressiveness and delegation both undermine this carefully designed web of institutional virtues that aim to balance deliberation with energy, and majority rule with minority viewpoints (Tulis 1987). For example, congressional critics of the Obama administration today look at Syria, Iraq, and elsewhere, and fault him for “taking a nap” through these crises while offering few serious specifics of their own (Office of Speaker 2014). The Supreme Court ruled recently against certain executive [*347] orders and recess appointments, but has little interest in taking up foreign and military policy outside of detainees’ constitutional rights. Elaine Scarry’s book is a call for the country to reject these habits and renew its original constitutional vows. Even the most sympathetic readers will sigh at this oddly hopeful ending. Adler, David Gray and Larry N. George, editors. 1996. THE CONSTITUTION AND THE CONDUCT OF AMERICAN FOREIGN POLICY. Lawrence: University Press of Kansas. Adler, David Gray. “Termination of the ABM Treaty and the Political Question Doctrine: Judicial Succor for Presidential Power,” PRESIDENTIAL STUDIES QUARTERLY 34 (1): 156-166. Bickel, Alexander M. 1962. THE LEAST DANGEROUS BRANCH: THE SUPREME COURT AT THE BAR OF POLITICS. Indianapolis: Bobbs-Merrill. Choper, Jesse H. 1980. JUDICIAL REVIEW AND THE NATIONAL POLITICAL PROCESS: A FUNCTIONAL RECONSIDERATION OF THE ROLE OF THE SUPREME COURT. Chicago: University of Chicago Press. Edelson, Chris. 2013. EMERGENCY PRESIDENTIAL POWER: FROM THE DRAFTING OF THE CONSTITUTION TO THE WAR ON TERROR. Madison: University of Wisconsin Press. Ely, John Hart. 1993. WAR AND RESPONSIBILITY: CONSTITUTIONAL LESSONS OF VIETNAM AND ITS AFTERMATH. Princeton, NJ: Princeton University Press. Farrier, Jasmine. 2010. CONGRESSIONAL AMBIVALENCE: THE POLITICAL BURDENS OF CONSTITUTIONAL AUTHORITY. Lexington: University Press of Kentucky. Fisher, Louis. 2005. “Judicial Review of War.” PRESIDENTIAL STUDIES QUARTERLY 35 (3): 466-495. Fisher, Louis. 2013a. PRESIDENTIAL WAR POWER (3rd edition, revised). Lawrence: University Press of Kansas. Fisher, Louis. 2013b. ON THE SUPREME COURT: WITHOUT ILLUSION OR IDOLATRY. Boulder: Paradigm Publishers. Glennon, Michael J. 1990. CONSTITUTIONAL DIPLOMACY. Princeton: Princeton University Press. Howell, William G. and Jon C. Pevehouse. 2007. WHILE DANGERS GATHER: CONGRESSIONAL CHECKS ON PRESIDENTIAL WAR POWERS. Princeton: Princeton University Press. Howell, William G., Saul P. Jackman, and Jon C. Rogowski. 2013. The Wartime President. Chicago: University of Chicago Press. Koh, Harold Hongju. 1990. THE NATIONAL SECURITY CONSTITUTION: SHARING POWER AFTER THE IRAN-CONTRA AFFAIR. New Haven, CT: Yale University Press. Kriner, Douglas L. 2013. AFTER THE RUBICON: CONGRESS, THE PRESIDENT, AND THE POLITICS OF WAGING WAR. Chicago: University of Chicago Press. Mann, Thomas E. and Norman J. Ornstein. 2012. IT'S EVEN WORSE THAN IT LOOKS: HOW THE AMERICAN CONSTITUTIONAL SYSTEM COLLIDED WITH THE NEW POLITICS OF EXTREMISM. New York: Basic Books. Pfiffer, James P. 2008. POWER PLAY: THE BUSH PRESIDENCY AND THE CONSTITUTION. Washington DC: Brookings Institution Press. Posner, Eric A. and Adrian Vermeule. 2011. THE EXECUTIVE UNBOUND: AFTER THE MADISONIAN REPUBLIC. New York: Oxford University Press. Silverstein, Gordon. 1997. IMBALANCE OF POWERS: CONSTITUTIONAL INTERPRETATION AND THE MAKING OF AMERICA FOREIGN POLICY. New York: Oxford University Press. Tulis, Jeffrey K. 1987. THE RHETORICAL PRESIDENCY. Princeton: Princeton University Press. Yoo, John. 2010. CRISIS AND COMMAND: A HISTORY OF EXECUTIVE POWER FROM GEORGE WASHINGTON TO GEORGE W. BUSH. Kaplan Books. Zeisberg, Mariah. 2013. WAR POWERS: THE POLITICS OF CONSTITUTIONAL AUTHORITY. Princeton: Princeton University Press. Copyright 2014 by the Author, Jasmine Farrier.